During the North-African/Arabian revolutions I noticed how information and news arrived from multiple sources over communication channels at different times. News arrived first via internet and moved on to 24h news channels that include social media and finally appeared on the evening news (e.g. German “Tagesschau“). A colleague of mine mentioned he noticed an evident delay between Arabian news broadcasts that consider twitter and online news websites and German evening news when he worked in Arabian countries at that time. News on Arabian TV were days ahead German news. I wondered what might be the reason and tried to figure why this delay is noticeable. 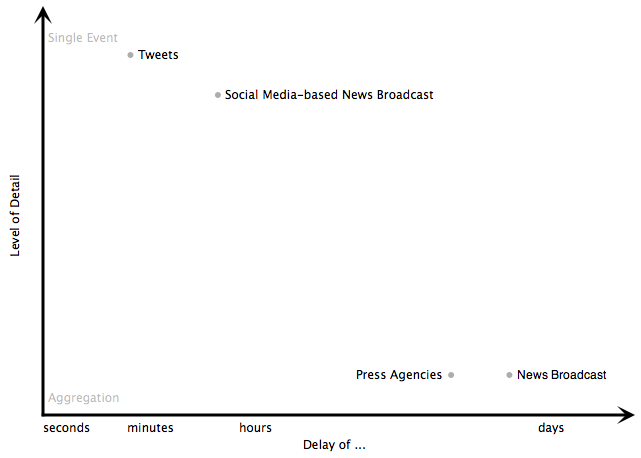 Obviously, news broadcaster pursue the goal of timeliness differently. The reason is the possibility of incorrectness of a news report the smaller the delay after the happening. Sometimes sources are not very reliable and trustful, and do need verification. Sometimes events and the implications are very obvious but sometimes it is only a small detail which is only a small part of the big picture. 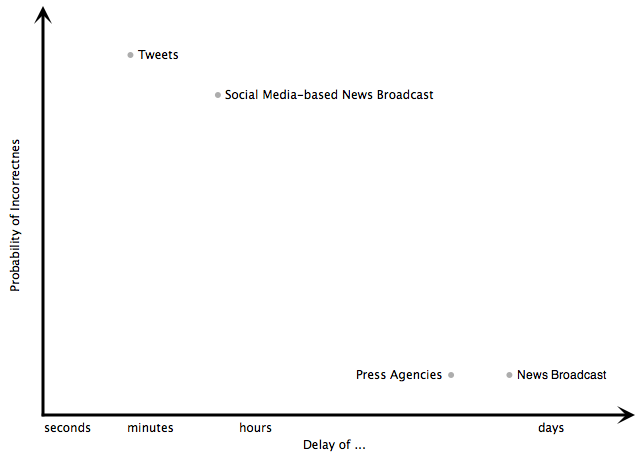 In the following figures I tried to capture these trade-offs for four different types of news/communication channels: Twitter, Social Media-based News, Press Agencies and (conservative) News Broadcasts. The chance for incorrect reports versus an expected delay to further verify and aggregate news is one of the trade-offs made by news channels. The settings resp. chosen trade-off of the four channes is depicted in the first figure. The same statement is true for the level of details of a channel. While fast channels provide small details and are not able to aggregate yet, the slower channels can sketch a brighter picture. The second figure draws a trade-off map for the level of details and timeliness. So, what is the right trade-off and which is the channel to follow? The answer is pretty simple when you understand how information and the big picture matures over time. Follow fast channels according to your interest in the topic but be aware that there is a certain chance for incorrectness and misinterpretations. Then over time the information and reports will get aggregated and validated, and finally be distributed by press agencies and broadcasted on TV by your favorite news anchor. If you are aware of this process you are able to handle early information, knowing it requires validation and an evaluation of the source, and that aggregators are reasonable news aggregators to leverage. Slow news channels such as evening news on TV should be respected as the “quasi” final confirmation of a news report (notice: mistakes and incorrect reports still possible but low chance!). Be happy to possibly be informed shortly by fast channels such as Twitter but do handle information careful as the maturity process still proceeds.